When it comes to the NHL Awards, a handful are earned on statistical achievement with the rest won through votes. The list below itemizes trophy winners for the 2011 NHL season. Additional honors were bestowed upon Thomas, Lidstrom, Weber, H. Sedin, Perry, D. Sedin for making the 2011 NHL First All-Star Team. Second All-Star Team accolades went to Rinne, Chara, Visnovsky, Stamkos, St. Louis, and Ovechkin. 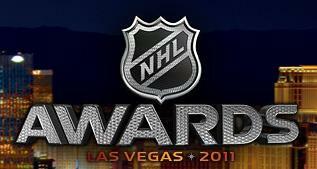 No winners were selected for the Scotiabank Fan Favorite and NHL Lifetime Achievement awards. * See also 2015 NHL Individual Awards Winners. * See also 2014 NHL Individual Awards Winners. * See also 2013 NHL Individual Awards Winners. * See also 2012 NHL Individual Awards Winners. * See also 2010 NHL Individual Awards Winners. * See also 2009 NHL Individual Awards Winners.